Journalists (in ball caps) Javier Canales Fernandez and Alejandro Hernandez Pacheco were rescued Saturday. Mexico City, Mexico (CNN) -- Mexican federal authorities have arrested three suspects accused of kidnapping three journalists last week, officials announced Thursday. Four journalists were reported abducted July 26 and held captive for several days. Federal police rescued two and a third was released. The whereabouts of the fourth journalist -- or who kidnapped him -- was not immediately clear. The kidnappers wanted to use the reporters, who were connected with some of Mexico's largest news organizations, to force the media to transmit messages alleging corruption by some public officials under the influence of rival drug gangs, Mexican federal Police Commissioner Facundo Rosas Rosas said at a televised news conference. The suspects belong to the Pacific Cartel, the police chief said. Rosas identified the three men, who were arrested Wednesday, as Jesus Antonio Villa Nevarez, 25, known as "El Yesi;" Gilberto Cervantes Pinto, 33, known as "El Gil;" and Oscar Manuel Gutierrez Gomez, 23. 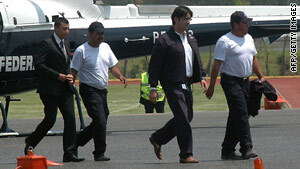 Villa Nevarez organized logistics for Pacific Cartel cell, Rosas said, while Cervantes Pinto was second in command. Gutierrez Gomez was an operative in the cell and also kept watch over kidnap victims, Rosas said. The journalists had been covering the arrest of a prison warden in the city of Gomez Palacio in Durango state. The prison director, Margarita Rojas Rodriguez, is accused of letting inmates out at night to commit drug-related slayings. The arrests were made at two locations in the same area in which the abductions took place, Rosas said.